Background Pemetrexed (Alimta) is widely used in combination with platinum as a first-line treatment of mesothelioma and adenocarcinoma of the lung. It is also approved for use in the maintenance setting as a single agent after patient completion of 4 to 6 cycles of a platinum-based doublet regimen for non–small cell lung cancer. With the increasing use of pemetrexed and longer durations of therapy, unexpected cumulative toxicity or other toxicities are possible. Case Report We report a case of a patient receiving maintenance pemetrexed for advanced adenocarcinoma of the lung who developed communicating hydrocephalus. Conclusion We are not aware of any other reports of communicating hydrocephalus in association with pemetrexed therapy. As more patients routinely receive pemetrexed as maintenance therapy, the development of toxicities or unexpected diagnoses is possible and may be a consideration in the chronic management of such patients. Pemetrexed (Alimta) is widely used in combination with platinum as a first-line treatment of mesothelioma and adenocarcinoma of the lung. It is also approved for use in the maintenance setting as a single agent after patient completion of 4 to 6 cycles of a platinum-based doublet regimen for non–small cell lung cancer. With the increasing use of pemetrexed and longer durations of therapy, unexpected cumulative toxicity or other toxicities are possible. We report a case of a patient receiving maintenance pemetrexed for advanced adenocarcinoma of the lung who developed communicating hydrocephalus. A 40-year-old male in good health with no history of smoking presented with a 2- to 3-month history of cough. A computed tomography (CT) scan of the chest showed a centrally obstructing mass in the right middle lung. Bronchoscopy revealed a partially occlusive endobronchial lesion in the right middle lobe bronchus intermedius that was positive for poorly differentiated adenocarcinoma. A positron emission tomography scan showed hypermetabolic activity in the right lung mass and multiple metastatic lesions throughout the axial and appendicular skeletons. Epidermal growth factor receptor mutation status was intermediately positive. The patient was enrolled in a clinical trial and received carboplatin, paclitaxel, and bevacizumab for 4 cycles, complicated by grade 1 peripheral neuropathy and thrombocytopenia, as well as grade 2 phlebitis and leucopenia. Otherwise the patient did not require any dosage modifications or delays. His follow-up CT scans showed partial response in the lung and stable osseous disease. Per protocol, he was randomized to maintenance therapy with pemetrexed 500 mg/m2 every 3 weeks. At cycle 13, he developed dizziness and grade 3 hypertension (blood pressure 190/104 mmHg). Serum creatinine doubled from 0.5 mg/dL to 1.1 mg/dL. 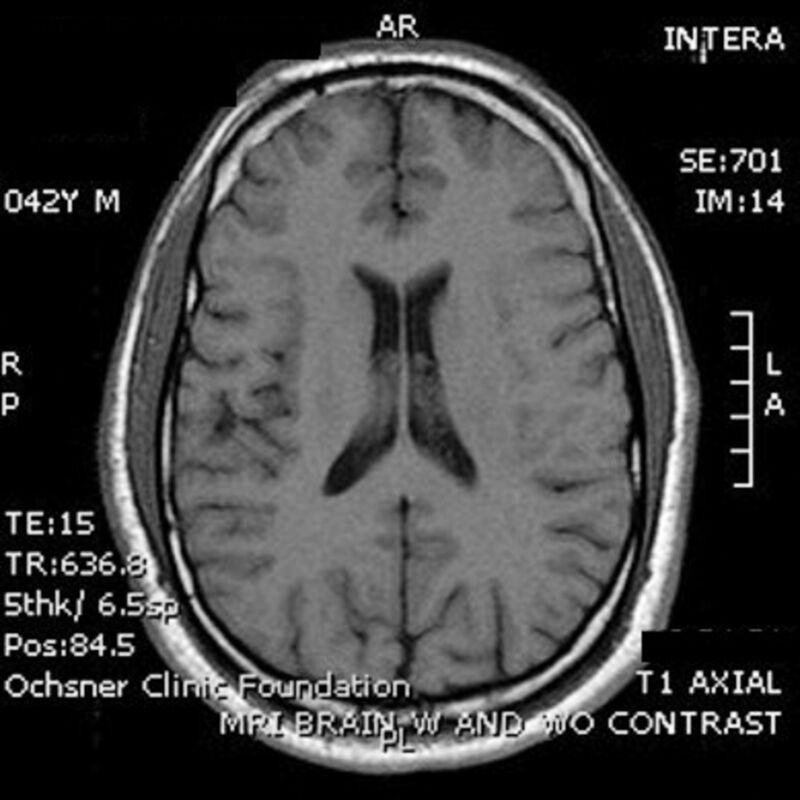 Magnetic resonance imaging (MRI) of the brain was negative (Figure 1). Amlodipine was started for hypertension. Pemetrexed was withheld for 2 weeks and then resumed at full dose. At cycle 19, the patient's blood pressure again increased and was accompanied by complaints of fatigue, headache, nausea, vomiting, and visual disturbance. Serum creatinine increased to 1.8 mg/dL. Pemetrexed was reduced by 25% for the next cycle. Amlodipine was discontinued, and metoprolol and valsartan were prescribed for hypertension. 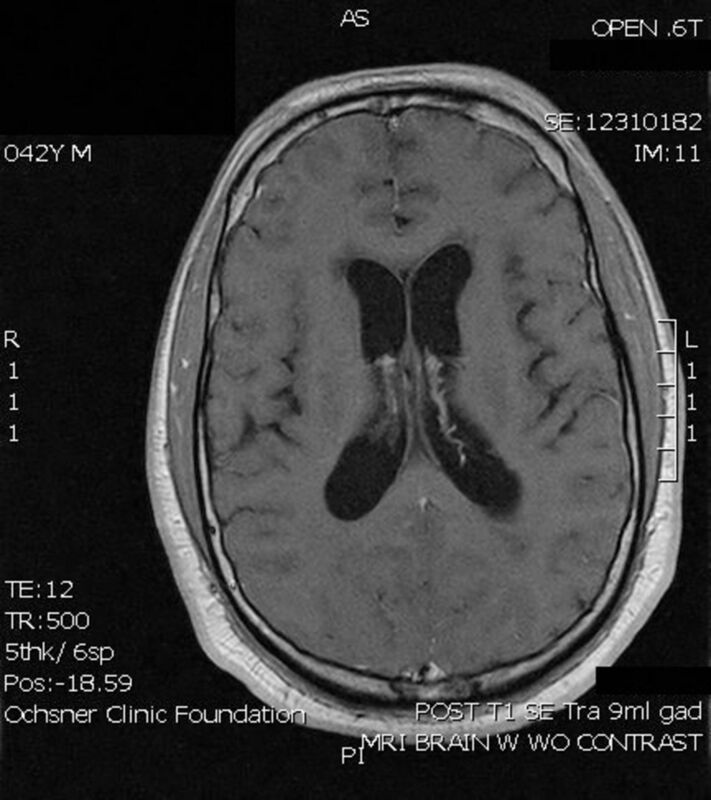 Another MRI of the brain showed interval enlargement of the ventricular system consistent with communicating hydrocephalus but with no evidence of metastatic lesions or meningeal carcinomatosis (Figure 2). Treatment with pemetrexed was discontinued, and the patient was removed from the clinical trial. Normal magnetic resonance imaging at onset of neurologic symptoms in patient after 13 cycles of pemetrexed. Magnetic resonance imaging showing development of hydrocephalus after 19 cycles of pemetrexed. Serial lumbar punctures were performed a total of 4 times, with removal of 10-25 mL of cerebrospinal fluid (CSF) each time. The patient noted transient improvement of symptoms after each procedure. CSF cytology was repeatedly negative, and other studies—including cell count, protein, gram stain, bacterial and viral cultures, and West Nile virus serology—were all negative and/or normal on each procedure. Neurosurgical consultation was obtained, and a lumbar-peritoneal shunt was placed. The patient showed symptomatic improvement; follow-up brain MRI showed decreased ventricular enlargement. The patient was subsequently started on erlotinib. Acquired hydrocephalus in adults is usually associated with central nervous system (CNS) infections or tumors, especially posterior fossa medulloblastomas, astrocytomas, and ependymomas. These conditions are associated with the obstructed flow of CSF through the ventricular system and impaired CSF absorption.1 CT or MRI typically shows ventricular dilation proximal to the level of obstruction. Regardless of the etiology, symptoms of hydrocephalus are the result of increased intracranial pressure (ICP) and can be nonspecific.4 Headache, vision disturbances, nausea and vomiting, anorexia with weight loss, lethargy, drowsiness, difficulty concentrating, behavioral changes, and hypertension are possible. Examination is often unremarkable, but hypertension and bradycardia may be present. Papilledema may be seen on fundoscopic examination, but other cranial nerve findings are not usually present unless the ICP is advanced, causing brainstem pressure. This patient presented initially with stage 4 adenocarcinoma of the lung, primarily with osseous metastases, nearly 18 months prior to the onset of symptoms that led to the diagnosis of communicating hydrocephalus. Serial lumbar punctures consistently showed clear and biochemically normal CSF with normal pressures. Cytology and infectious etiologies were negative. Hemorrhage was not evident, and no history of trauma existed. Symptoms improved with placement of a shunt and cessation of pemetrexed therapy. We are not aware of any other reports of communicating hydrocephalus in association with pemetrexed therapy. As more patients routinely receive pemetrexed as maintenance therapy, the development of toxicities or unexpected diagnoses is possible and may be a consideration in the chronic management of such patients. (12, 2006) The occurrence of obstructive vs absorptive hydrocephalus in newborns and infants: relevance to treatment choices. Childs Nerv Syst 22(12):1543–1563, pmid:17091274, Epub 2006 Nov 7. (1978) in Neurological Pathophysiology, Hydrocephalus, eds Eliasson SG, Prensky AL, Hardin WB (Oxford University Press; New York, NY) In, eds. (1994) in Pediatric Neurosurgery. 3rd ed, Hydrocephalus: etiology, pathologic effects, diagnosis, and natural history, ed Cheek WR (WB Saunders Company; Philadelphia, PA) In, ed. (1, 1989) Symptoms and signs of progressive hydrocephalus. Arch Dis Child 64(1):124–128, pmid:2923462. (4, 2012) Teratogen update: methotrexate. Birth Defects Res A Clin Mol Teratol 94(4):187–207, pmid:22434686. (1979) Communicating hydrocephalus in treated leukemic patients. Eur Neurol 18(1):8–14, pmid:285859. (7, 2012) A case of HER2-positive breast cancer receiving lapatinib+capecitabine chemotherapy with ventriculoperitoneal shunting for hydrocephalus associated with brain metastases [in Japanese]. Gan To Kagaku Ryoho 39(7):1115–1117, pmid:22790050.